Whether you're searching for the perfect gift for your yogi sister or the running diva in your life, fitness gear is a welcome and useful gift! 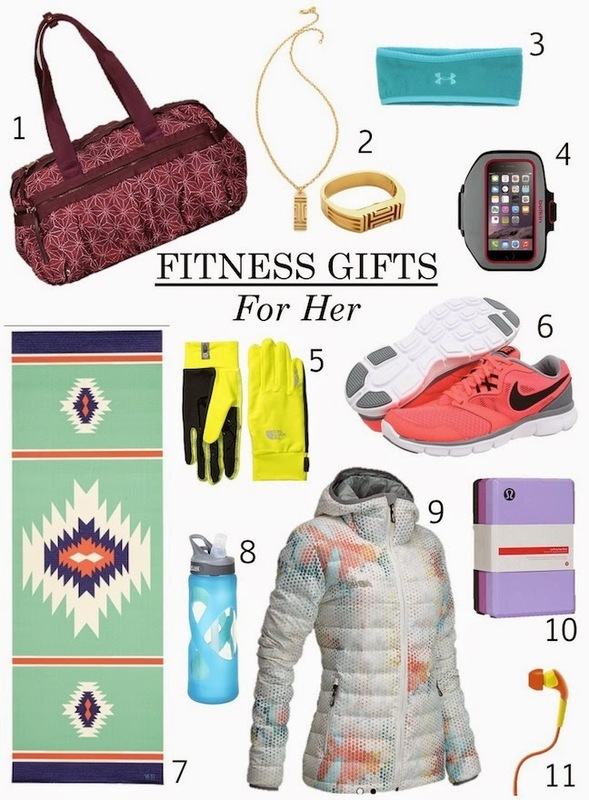 From luxe Fitbits to neon sneakers to printed yoga mats, below are a few of the fitness gifts on my wish list. 1. Lululemon Gym Bag $148: Make sure colleagues know your gal is a fashionable fitness fiend by gifting her a stylish and coveted Lululemon duffel bag. 2. Tory Burch for Fitbit Necklace $175 and Tory Burch Fitbit Bracelet $195: Great gifts for health minded ladies who like a bit of luxury, Tory Burch for Fitbit makes counting calories look enviable. 3. Under Armour Headband $16: Add a touch of brightness to your workout gear while keeping warm this winter with a fleece fitness headband. 4. Belkin Sportfit iPhone Armband $30: An iPhone case armband makes working out sans handbag convenient. A great gift for runners and gym rats alike! 5. Northface Running eTip Glove $25: Northface eTip gloves are necessary for iPhone addicts who can't take the cold. Combined with a reflective color and moisture wicking properties, these make the perfect gift for women who run rain or shine. 6. Nike Flex Running Shoes $65: Gift your fitness gal a pair of bright colored Nike - top rated for comfort and performance- they will surely make her moves noticed. 7. Yeti Yoga the Rowen Yoga Mat $60: A patterned yoga mat is the coolest gift for the yogi in your life. 8. Camelback Water bottle $25: Forget plastic and gift some fitness gear that good for the environment and cute to boot! 9. New Balance Down Jacket $219: Keep warm while looking cool on the slopes this winter with a printed down jacket from New Balance. 10. Lululemon Yoga Block $12: A cute colored yoga block is a great fitness gear gift to act as a unique stocking stuffer or accompany a yoga DVD.